In late January 2001, Anchor Mike Jacobs and a cameraman from Milwaukee's WTMJ-TV made the long journey from Milwaukee to Mondovi WI, to tape an interview with IMMLY founder Jacki Rickert. View the interview here on streaming video! 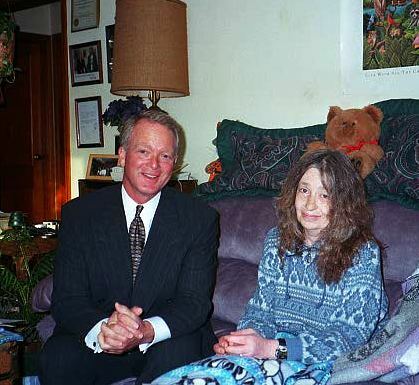 The interview aired on February 19 of 2001, and an estimated 180,000 viewers in the Milwaukee area had a chance to hear Jacki's story: years of dealing with debilitating medical conditions, being approved for federal medical marijuana supplies, and then never receiving them, presidential candidate Bill Clinton's broken promise to "make it right", of the raid on her home in March 2000, days after reporting a theft from her home and other facets of her long courageous and painful struggle to gain legal access to the medicine that provides such amazingly beneficial results for her. On October 27, 2001 in Chicago, Mike Jacobs received an Emmy Award for "Outstanding Reporting" for a composite of three stories he did in 2001, one of which was the interview with Jacki. Category #29 Outstanding Achievement for Individual Excellence On Camera - News Reporters. Jacki and IMMLY are very pleased to hear of the Emmy Award and offer our congratulations to Mike Jacobs and WTMJ-TV, and hope that this award will keep her plight and the plight of all the other Jackis out there in the public eye so that hopefully someday soon, patients who can benefit from the medicinal use of cannabis will not have to be put through the kinds of ordeals Jacki has endured in her long battle for justice. IMMLY also wants to extend our deep appreciation to Chadman for converting the original video to streaming video so it can be viewed on this website..